PHOTOS BY THE AUTHOR AND KRISTEN PETERSON Was this the American home of the future—this cross between a submarine and a World War II Quonset hut, this metal half-sausage afloat on a sea of mud? •	First, be a mobile home, light and small enough to be towed long distances over the road, or be carried by helicopter, or even be floated on water. •	Second, be independent of utility hookups—electricity, gas, water, and sewage—and of fossil fuels. •	Third, be mass-producible at a cost competitive with luxury travelers of comparable size. It would be just the thing that Ted Bakewell, 33, an executive with Bake-well Corp., a giant St. Louis real-estate development company, would like to park outside one of his new developments without concern for water or sewers—and in places where such hookups might not even be available. Silo shell “Let’s look at the external features first,” says Bakewell, leading the way through the large muddy field in the center of a Bakewell office park. “The shell, for example.” The interlocking, aluminized-steel sections that form the rounded ends of the vehicle are normally used for silo tops. The center section would normally be used to join twin silos. “They’re very thin sheets, fabricated with a ridge in each panel, so they easily slide together, interlocking, for a totally watertight seal,” Bakewell says. Turbine ventilators—three in summer, two the rest of the year—also pull out hot air. The turbines are large for the space, to assure maximum ventilation. There are vents in the ends of the structure, making for “tremendous cross-ventilation,” says Bake-well, even with the doors closed for security. The third ventilator is replaced by a stovepipe in winter. “Also, that being the highest point on the structure in the winter,” Bakewell says, “it is fitted with a branch of the lightning-rod cable, so the chimney becomes a third lightning rod at this time of year.” The cable runs to a stout copper rod planted 10 feet in the ground. The sides of the vehicle are painted black and are covered with corrugated, translucent fiberglass. There is an air space between the metal and the fiberglass. Small, super-efficient blowers (designed to cool electronic equipment in the nose cones of jet aircraft) pull air through the space and into ducts inside that carry the heated air into storage compartments. Now we’re coming into the entry-way—an area, covered by a transparent roof, that is designed to be a greenhouse for small hydroponic plantings, an occasional cooking area (there is a solar cooker), a sun porch when a hammock is stretched across it, and a mudroom. Floors and walls are cov- ered with a material called TileDek, designed for swimming-pool decks. On the floor, mud drops through to the subfloor. On the walls, the material serves as a handsome and useful perfboard. The material is also fireproof. Where had they come across it? Says Jantzen, “It was in your ‘What’s New’ section not too long ago” [WN Home Improvement, Aug. ’79], Then they read POPULAR Science? 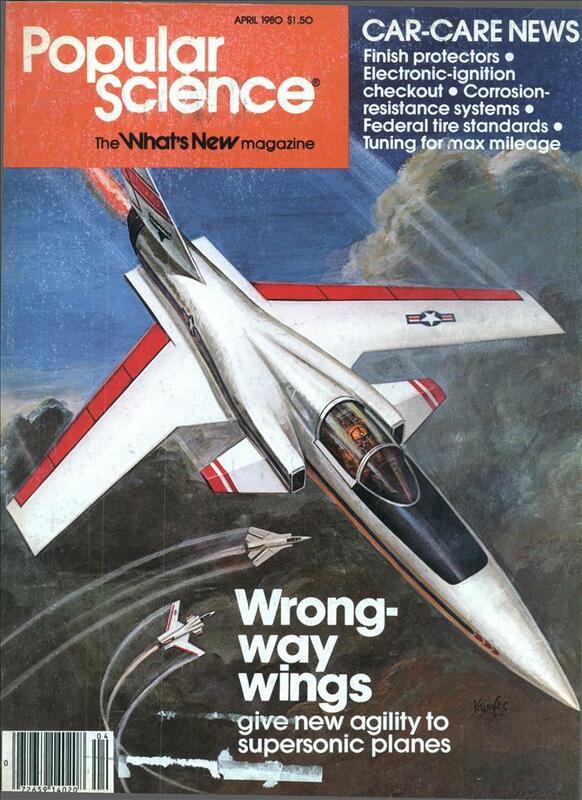 “Best magazine going,” Bakewell adds. The table and bed are lined with superinsulating isocyanurate boards, a material called Thermax. One board has an R-value of eight. A double thickness with air space gives the heat-storage chamber an R-value of 16. Little doors at the bases open to release heat. Inside, the structure has been sprayed with two layers of material: a polyurethane foam, 3-1/2-four inches thick, primarily for insulation, followed by a flameproofing and sound-deadening layer of Durafiber, a test material with a half-hour fire rating in addition to some insulating value. The weight problem, as with everything in a mobile vehicle, has been carefully considered. All the polyurethane foam weighs only 200 pounds. (The metal shell for the whole structure weighs only 556 pounds.) The fluorescent lights over Bakewell’s drawing board were developed for the space program. Their secret: a high-frequency ballast used with a standard fluorescent tube. They have low and high settings. Built-in counters line both ends of the structure, where the curving walls would make it impossible for a person to stand up. At the dining end, they are used for food service. At the bed end, they cover clothes-storage compartments. Furnishings for living areas Soft foam-plastic cubes serve for seating in the sitting area—not very comfortable, I thought. 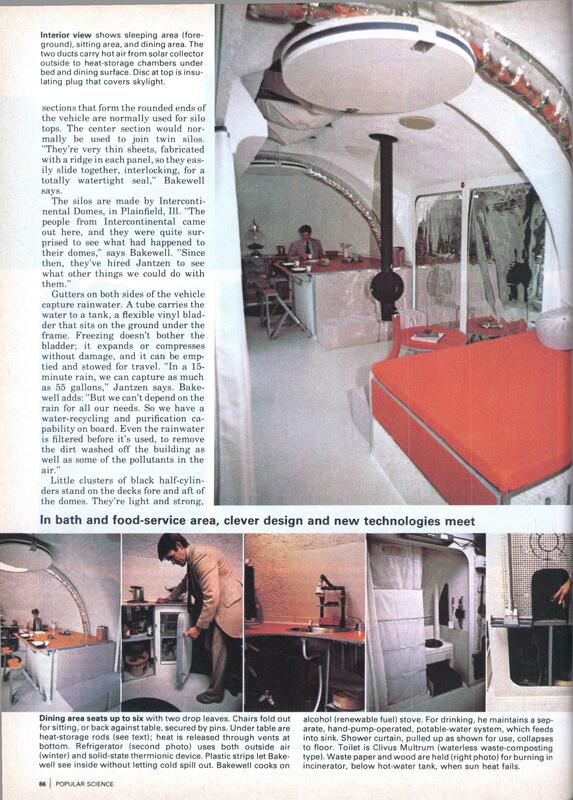 An Insulating Shade—the same kind featured in Popular Science in January 1979— covers the large patio doors. Jantzen and Bakewell have had trouble rolling the shade up, but now the manufacturer has a chain mechanism that helps, and they think the problem is solved. For the coldest months, there will also be a one-inch-thick panel to increase the barrier to the cold. A wood stove, like a black soccer ball over an orange tube, creates a not-unattractive sculpture in the sitting area. Jantzen created the design for his own house. The last artifact in the sitting area is an ingeniously designed coffee table, made, apparently, from a half panel of plywood. There is a moment of silence when the visitor comments that Jantzen should have submitted the table to the PS plywood-design contest. “We all thought Mike should have won that one,” Bakewell adds. In the dining area, inventive design abounds. Leaves drop down or snap up to extend the table. Seats drop down to get out of the way. Most of Bakewell’s cooking is done on an alcohol stove; he believes in using renewable fuels as much as possible. The refrigerator was designed from scratch. In winter, ducts below bring in cold air, saving electricity. A butterfly valve controls the amount. In summer, a solid-state thermionic device supplies cooling. The toilet area contains a shower and a Clivus Multrum Bio-Loo, a Swedish waterless toilet that composts human waste odorlessly. The shower resembles a nylon telephone booth. Square hoops support an ingenious curtain arrangement (see photo) sewn together by Jantzen’s wife, Ellen. Bakewell economizes on water by using a special nozzle head, developed for distributing chemicals from crop-dusting planes. It is capable of producing a very fine water-conserving mist that is, he says, nonetheless very effective in washing. Or, if he feels like splurging, he can open it up all the way. Bakewell showers with, basically, recycled water from a gray-water (used wash water) tank, to which he adds, as needed, fresh water taken from the vinyl rainwater bladder. The gray-water tank, under the kitchen floor, is just above the rainwater tank, which rests on the ground. A pump takes water from the rainwater tank through filters to the gray-water tank. Next to the toilet area is the opening to the incinerator. Here waste wood and paper are stored. The hot-water tank is built around the incinerator. When sun heat fails, Bakewell burns his waste material and heats his water that way. What did all this cost? Bakewell es- timates $16,500. The cost doesn’t include their own time, but it does include all their mistakes. “One thing is important to note,” Bakewell says. “This has been a completely private endeavor—no grants, no subsidies— and as such we’ve been motivated to be a lot more clever with some of our materials and cost savings than if we’d had a huge subsidy to put the whole thing together. We have integrated in one system the state of the art in all the little systems that usually come as individual components. A Japanese architect who visited the Autonomous Dwelling Vehicle saw it as a good mass-production possibility. With floating collars around the units, he thought, they could be grouped to form residential marina colonies in countries with poorly developed utility infrastructures. But that’s in the future. Right now it’s probably the most energy-efficient house in the country. Thats one cool Hick Hut, I’ed buy one! Whatever happened with this anyway? And would this be viable as an emergency shelter. @ michael jantzen – Michael, I’ve just been looking over your website, man you’ve got some wild mind there, really cool stuff! Do you have any info on building some of your projects for people who might be intertested? Michael’s work remnds me somewhat of Bill Lishman, a Canadian inventor/designer/artist, perhaps most famous for the film “Fly Away Home”. His farmhouse has some remarkable ideas incorporated into it.